This photoessay first appeared in the April 2013 issue of Ottawa Magazine. 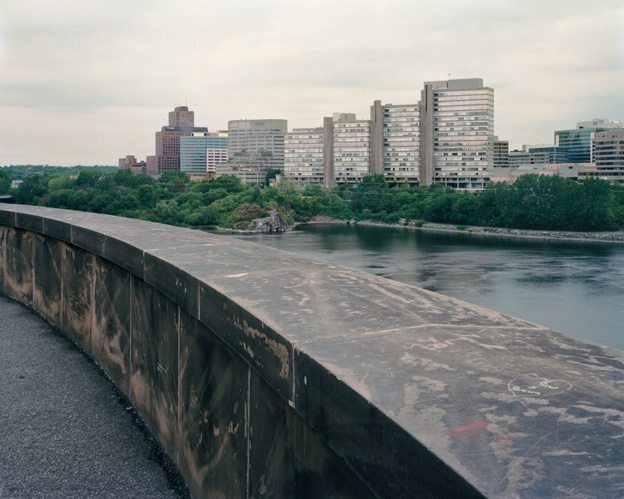 Official Ottawa by Tony Fouhse is on view at the OAG Annex July 18 to Oct. 11. More details here. Or is it? The political machinations meet the daily mundane when photographer Tony Fouhse turns his lens on the structures and subtext of our capital. A view across the Ottawa River to Place du Portage. Photo by Tony Fouhse. It is not so much that appearance can be deceiving. That explanation would be too simple for how award-winning photographer Tony Fouhse sees his hometown (plus, let’s remember, sometimes things are exactly as they appear). Fouhse’s perspective comes from working on the periphery, a spot from which he sees the entire arc of a story rather than the narrative points reporters tend to lead with and photographers file to their employers. From here, he can see what happens before the national news conference, before the limousine has a passenger, before the ambassador speaks. Official Ottawa is about more than having an eye for contradictions, juxtapositions, or dichotomies. Were it merely this, there would be something disjointed in the images of Tony Fouhse, something of a Two Solitudes oeuvre rather than the sensation, time and again, of looking at one of his photos and feeling you are looking at — to borrow a phrase Hemingway used to describe an honest sentence — the true gen. I think it helps that Ottawa is his hometown. Fouhse understands, as only a native-born can, that the prime minister’s limo has people inside who work for a living, knows that before a giant portrait of the Queen hung in the foyer of Foreign Affairs, there was something else. He can also accept, at the end of a photo shoot with the Kazakhstan ambassador, an inexpensive pen with the portentous inscription Kazakhstan: Land of Interracial Peace and Harmony — accept it without a smirk or even without surprise that the gift is being offered by a sincere man. If you’re looking for hipster irony, you’ve come to the wrong place.